The first class smoking room on Promenade Deck was a smart room designed to appeal to both sexes. 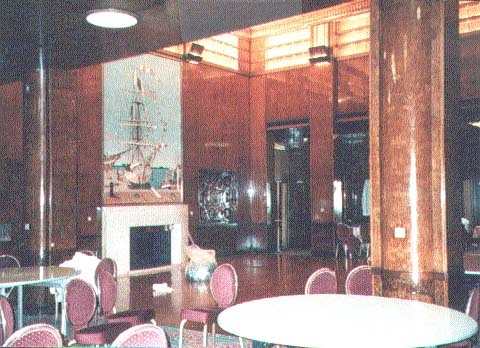 Brightened by light from large windows on both sides, modern surrealist paintings on the bulkheads, carefully coordinated multi-colored leather furniture, carpets and linoleum, it was another example of the sophisticated blend of the traditional and modern that won the Queen Mary the hearts and loyalty of her first class passengers. Left - Rare pre-war color photo of the first class smoking room - then called cabin class. Note the circular form of the columns. After the war these were "squared off." "The beautifully proportioned smoking room which occupies the aftermost part of the promenade deck house, extends through two ‘tween decks, and the apartment is surmounted by a large dome, giving a height of about 22 ft. The horizontal dimensions are 42ft. by 69ft. Fewer concessions to the modern spirit have been made here than in any other room. Messrs. Trollope & Sons have been responsible for carrying out the decorative scheme of this apartment. Left - A carving detail from the room's cornice. The fireplace in travertine has a large dog-grate, burning coal – the only fireplace of its kind on board. The mural decorations, in English oak, with a dado and low panels quartered in walnut burr, create a restful and dignified atmosphere; while the large armchairs are fully in keeping with the general scheme. Among the furnishings of this apartment are some notable examples of leather craft, represented in wing chairs in red and mauve, blue and beige, and brown. They are provided with steel springs, and are stuffed with horsehair. 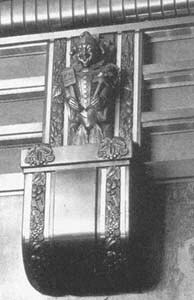 There are four large panels on the fore and aft boundaries, and at the sides of the chimney piece and bulletin board. These are of tiger oak burr, a natural wood which has a remarkable resemblance to tiger skin. 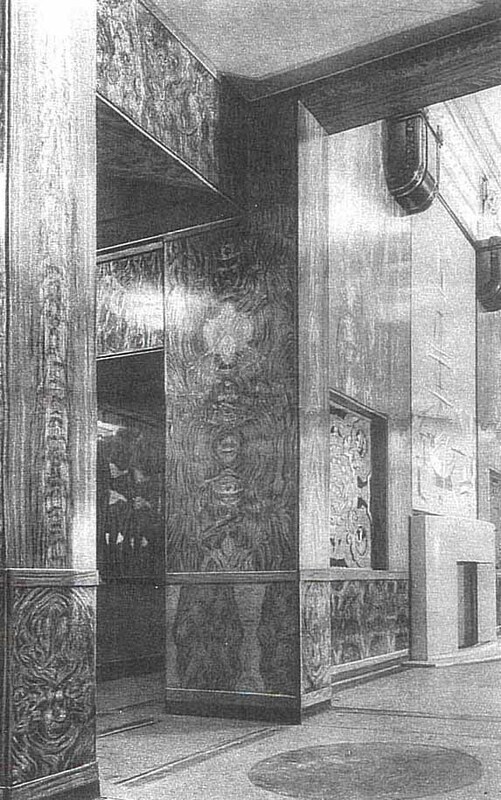 The beauty of the woodwork is enhanced by two pierced and carved screens flanking the fireplace, which have been executed by Mr. James Woodford, A.R.B.S., while at the forward and after ends of the room are two striking paintings by. Mr. Edward Wadsworth. The clock is set in an elaborate decorative surround, and further interest is provided by a striking series of cast-bronze electric-light sconce fittings, by Mr. James Woodford, in which motifs of playing cards figures are set against a background of tobacco leaves. 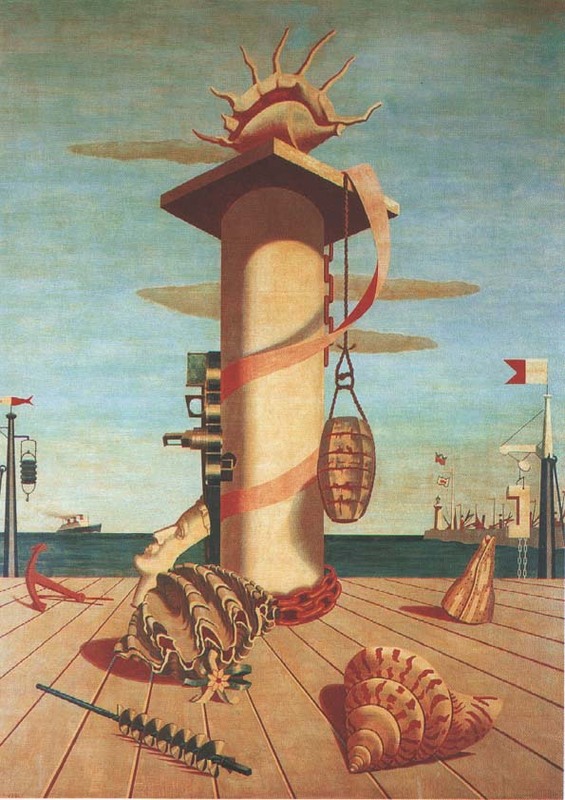 "The Sea" and "Dressed Overall at the Quay" by Edward Wadsworth, which face each other on opposite fore and aft walls of the Smoking Room. 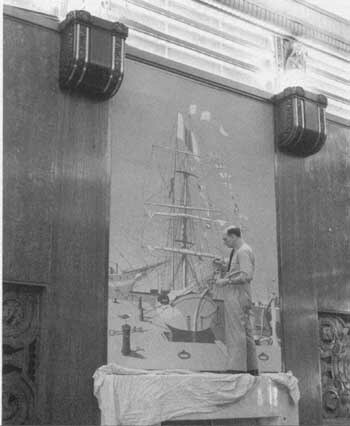 Edward Wadsworth painting one of the pictures above. The metal work is mainly in bronze, relief and interest being secured by the occasional introduction of silver bronze. The floor is richly carpeted, the center of the room being covered with a large hand-made Wilton rug in shades of dark brown, gold and cream, which introduces patterns in red and blue. On the starboard side of the smoking room a small cocktail bar is provided." 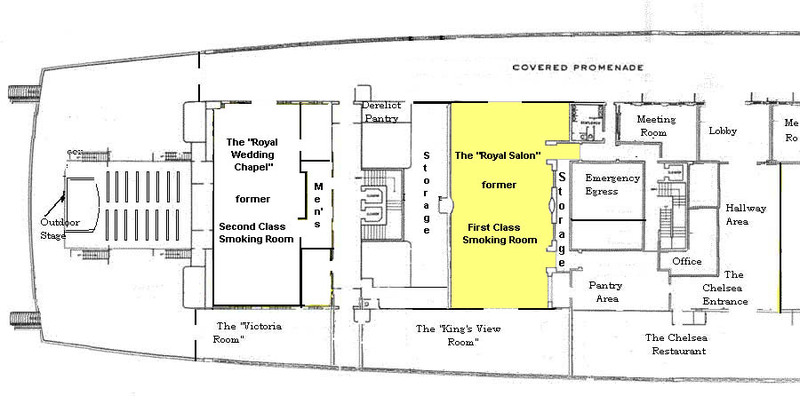 1936 - 1939 – Cabin (or first) Class smoking room as described above. 1940 - 1946 – The Queen Mary was used as a troop transport during World War II. 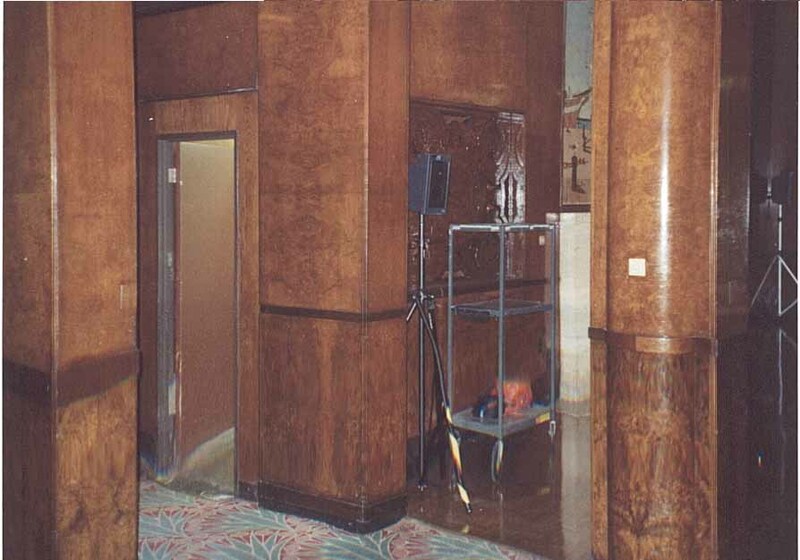 1947 - 1967 – In the postwar refit the smoking room was fully restored. The ceiling was lowered slightly to accommodate better air ventilation and cooling systems – sacrificing the "striking series of cast-bronze electric-light sconce fittings, by Mr. James Woodford, in which motifs of playing cards figures are set against a background of tobacco leaves." But in 1967 the original 1936 compliment of furnishings (chairs, tables, desks, heavy, hand-woven Wilton carpets, etc.) were in place when the Queen Mary arrived in Long Beach. 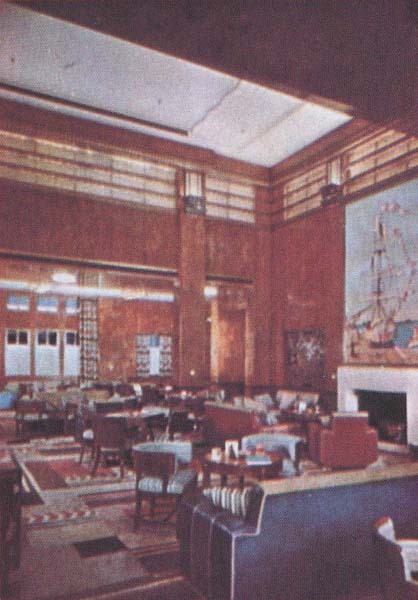 1968 to present – like all original passenger lounges from all three classes on the Queen Mary, the first class smoking room was stripped of all furnishings and pressed into service as a multi-purpose catering room. Many of the custom designed furnishings were sold off , with a few pieces retained for "exhibit" purposes. 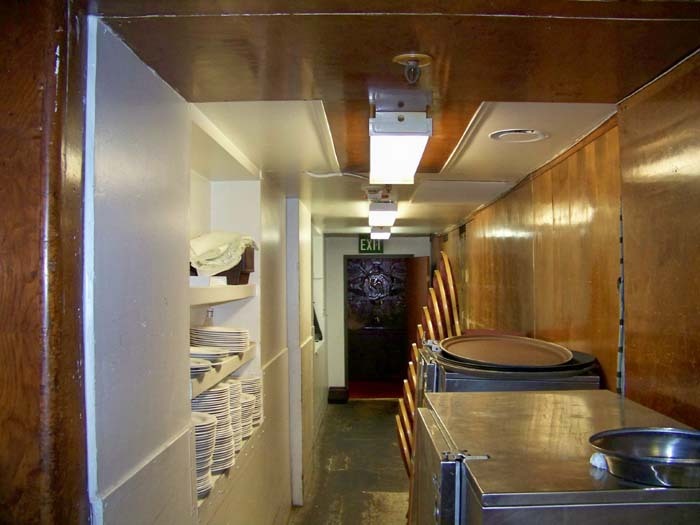 A large pantry and scullery was inserted behind the starboard bar. The area behind the fireplace and carved screens, (originally beautifully paneled and furnished with tables and chairs for a quiet game of cards or chess), was taken over as a table and chair storage area and has been heavily damaged though this use. The large windows on both sides of the room were covered over or replaced with solid folding wooden doors that permit access directly from the portside enclosed promenade. The "Kings View Room" which was inserted into the starboard enclosed promenade parallel to this room, darkening the starboard windows. Some of the carvings by James Woodford (mentioned above) in the room today. The result of this "conversion" is a still handsome and impressive " banqueting ballroom" called the "Royal Salon." It is unfortunately a darkened shadow of its former self. The paneling in the core area of the room is repaired along with water damage to the ceiling and the carpeting replaced every decade or so. The black and white 1936 Stewart Bale photograph on the left above shows the wood paneling and screens surrounding the fireplace in the first class smoking room. Note the light filtering through the screen and projecting flags on the wood panel behind it. 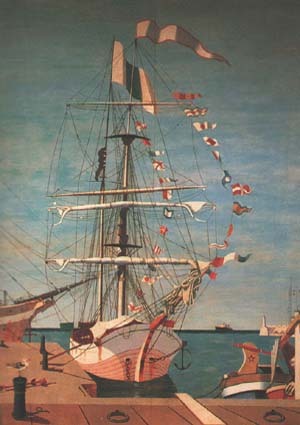 Like flags were incorporated into the painting over the fireplace. This is an example of the subtle beauty of detail in the decor aboard the Queen Mary that passengers found astonishing. At present the effect is totally lost as the screen is blocked with plywood panel (photos - right) and the area behind the fireplace is used as a rude storage pantry. Click on the images to expand them to full size. 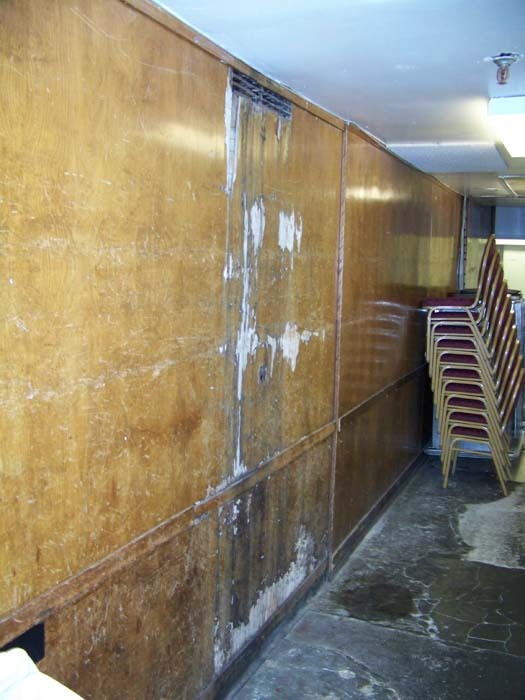 Damage in the forward part of the Smoking Room today. 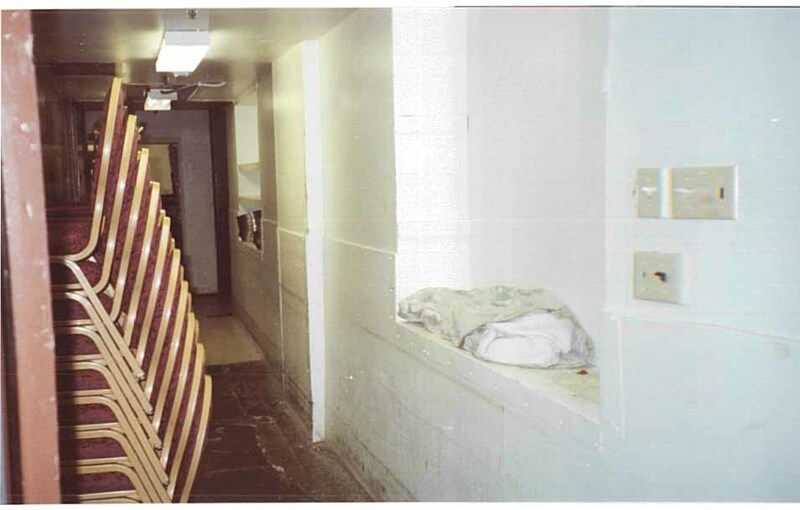 These areas were once part of the room. They were an alcove with game tables. 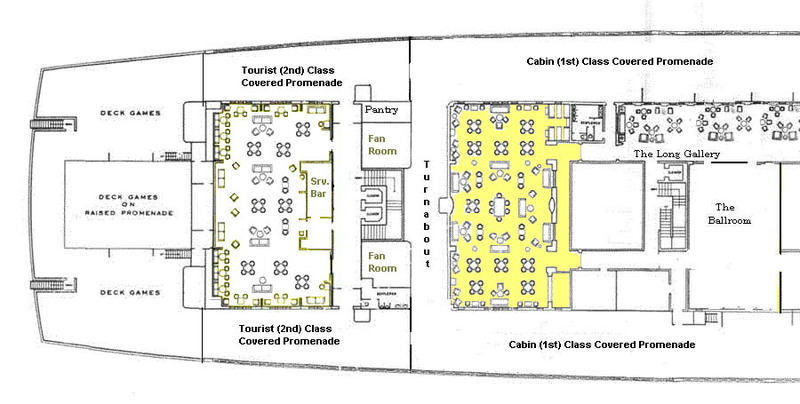 Our views on functional restoration are illustrated in our proposed deck plan for Promenade deck. A possible restoration showing restored pre-war turnabout. The proposed insertion of access lobbies between into the "golden circle" of public rooms allows them to be used ensuite, (i.e. in tandem), or individually, yet retain their original point of access and truly magnificent flow and sweep. The movement of the upper deck pantries to the raised Sun Deck and removal of banqueting from the room eliminates the massive pantry scullery requirement and the associated damage from storage and constant furniture movement. The elimination of the King’s View Room and the large, dark banks of folding doors on both inboard walls and restoration of the large windows admits light into what is now a dark cave. We believe that the value of an attraction and of a banqueting venue resides in its uniqueness and panache. 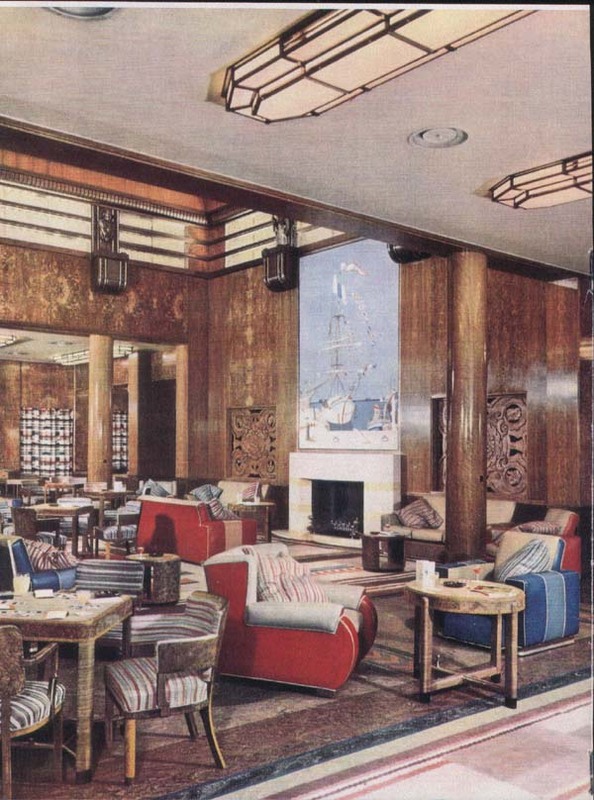 The fabulous suite of public rooms on the promenade deck was the crowning glory of the Queen Mary. Perhaps they will once again see the light of day in a fashion that makes them recognizable even to people fortunate enough to have sailed on her in her heyday.